The world of data protection law is buzzing with activity as the reader of the new issue 1/2019 of the European Data Protection Law Review (EDPL) can clearly observe. The latest edition of the journal covers a wide range of highly interesting analyses from Europe and beyond. We offer a strong international angle – with articles and reports on US, Japanese and Chinese developments and their link to the EU. 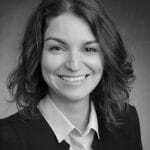 Read a timely assessment of the recent CNIL fine on Google LLC, case notes on AG Szpunar’s opinion in C-507/17 Google LLC v CNIL, on C-207/16 Ministerio Fiscal and the ECtHR’s Ben Faiza ruling. 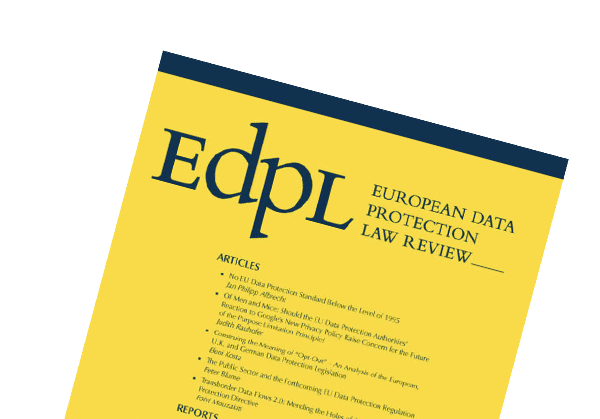 The articles in EDPL 1/2019 cover an array of topics including: adequacy findings for third countries that have ratified Convention 108, the alternative interpretation of right to be forgotten in Japan, and the data protection exemption for immigration purposes under the European Convention on Human Rights. View the whole content of EDPL 1/2019: HERE. The European Data Protection Law Review (EDPL) provides a practical and intellectual forum to discuss, comment, and review all issues raised by the development and implementation of data protection law and policy in the EU Member States. The peer-reviewed journal reports on key legislative developments and addresses relevant legal, regulatory, and administrative progresses in EU Member States and institutions. Important judgments that shape the interpretation and application of the EU law in this field are identified and analysed, particularly judgments by the European Courts, international courts and tribunals such as the WTO’s Dispute Settlement Body, and higher national courts. All contributions to EDPL shall undergo the process of a double blind peer-review, in order to guarantee the publication’s solid scientific output. The quarterly addresses everyone who is concerned with data protection law issues such as legal practitioners in national and international law firms, government officials working in EU public administration, judges and legal experts in domestic, European and international courts, consultancies, and Data protection professionals in the EU and beyond. Issue 4/2018 of the European Data Protection Law Review (EDPL) is out and it features the best 5 articles from our 3rd annual Young Scholars Award competition. This years’ top entries cover topics like interoperability of EU databases, contesting automated decisions and improving consent in information privacy. This rich edition of EDPL is packed with 8 insightful reports on, e.g. GDPR implementation in Italy, blockchain and the new data protection law in China. Also in the issue: opinions by Gary Marx and Woodrow Hartzog, case notes on C-498/16 Schrems, C-210/16 Wirtschaftsakademie, Benedik App no 62357/14 and Centrum för Rättvisa App no 35252/08, as well as the speeches by Giovanni Buttarelli and Tim Cook from the 40th International Conference of Data Protection and Privacy Commissioners. View the whole content of EDPL 4/2018: HERE. View our current Call for Papers for the Young Scholars Award. The new issue 3/2018 of the European Data Protection Law Review (EDPL) is out and it has a special focus on Health Data, Medicine and the GDPR. We are honoured to publish the opinions by Giovanni Comandé and Gianluca Montanari Vergallo on the special theme. Read the articles on AI and machine learning in medicine, data portability in health research and the EU Open Science Agenda, all critically analysed in light of the GDPR. Our regular rich Reports section features, among others, updates on the GDPR implementation in Belgium, the Netherlands and Romania. Find also in this issue: annotations on recent judgments by the CJEU (Jehovah’s Witnesses), the ECtHR (Lopez Ribalda v Spain) and the US Supreme Court (Byrd v US). View all articles of EDPL 3/2018. Issue 2/2018 of the European Data Protection Law Review (EDPL) is now available! You can find opinions by Artemi Rallo, former Director of the Spanish DPA, and Gus Hosein, Director of Privacy International. Other highlights from this edition: Scientific articles on, among others, the subsequent use of GDPR data for a law enforcement purposes and data protection by design and by default. Our GDPR Implementation Series continues with a report on Ireland. Case notes on CJEU’s Nowak case and the ECtHR’s Libert v France. View all articles of EdpL 2/2018. Become an Author for EDPL and view our Call for Papers. Contributions are welcome and should be sent to the Executive Editor Nelly Stratieva. Manuscripts should be sent preferably in Microsoft Word format. After the article manuscript is submitted, it will undergo the process of double- blind peer review where the accuracy, quality and relevance of the text will be evaluated. Please note that submission of a manuscript does not guarantee publication. Responsibility of the factual accuracy of a paper rests entirely with the author. The manuscript must also be complete and final in terms of formulation and factual information so that no major corrections – only of typesetting errors or the like – will be necessary after type -setting, when an edited version will be returned to the author. Authors whose first language is not English should however ensure that their final draft is carefully spellchecked, preferably by a native speaker of English, for accuracy. Subsequent requests for corrections cannot be processed. The author will receive a free copy of the issue after printing. Format). All contributions use footnotes, but not a list of references. Each article should start with a short abstract (without heading) of five to six sentences, heading level I. should be an introduction. Articles should be preferably submitted in British English. Tables should be inlcuded intext of the manuscript. -‘ibid’ should only refer to immediately preceding references. -‘$’, ‘€’, ‘£’ instead of ‘Dollar’, ‘Euro’, ‘Pound’etc. -‘Article’ instead of ‘Art.’, except in footnotes, where ‘art’ should be used. either (i) flash news or (ii) perspective articles. (ii) Perspective articles, on the other hand, should consist of a more detailed contribution, which should both highlight a topic of particular interest and provide readers with some critical and personal comments. In this case, just an embryonic bibliography is required and articles should be between 2000 and 3500 words. only of typesetting errors or the like– will be necessary after type-setting, when an edited version will be returned to the author. Authors whose first language is not English should however ensure that their final draft is carefully spellchecked, preferably by a native speaker of English, for accuracy. Subsequent requests for corrections cannot be processed. The author will receive a free copy of the issue after printing. Regarding citations & references, abreviations and style points, please refer to the ARTICLES section. with a * footnote giving the author’s affiliation and Email-address, the reference of the case in Italics and the headnote(s) in bold with a ** footnote for the legislation at issue (please see the example below). only of typesetting errors or the like–will be necessary after type-setting, when an edited version will be returned to the author. Authors whose first language is not English should however ensure that their final draft is carefully spellchecked, preferably by a native speaker of English, for accuracy. Subsequent requests for corrections cannot be processed. The author will receive a free copy of the issue after printing. The headline is the eye-catcher of the case note, which shall draw the reader’s attention to the case by summarising the main outcome of the case or the area of discussion in a short sentence and bold letters. The case note shall include the author’s name, affiliation and e-mail address. The full reference of the case shall be provided in italics, including its publication in the official journal of the respective Court. In cases where the judgment is not (yet) final, this fact shall be indicated. A product that includes in its composition a substance which has a physiological effect when used in a particular dosage is not a medicinal product by function where, having regard to its content in active substances and under normal conditions of use, it constitutes a risk to health without, however, being capable of restoring, correcting or modifying physiological functions in human beings (official headnote). This section shall guide the reader quickly to the main legislation at issue in Italics. It shall only provide the main legislation relevant to the case. Aricle 1 No. 2 of Directive 2001/83/EC on the Community Code Relating to Medicinal Products for Human Use, last amended by Directive 2004/27/EC, OJ L – 311, of 28.11.2004, 67–128. Give short names to the actors in brackets and continue using them throughout the summary. Wrap up the history of the legal proceedings, such as what the previous courts held on the issue and how the case came before the last instance court. The summary of the judgment shall embrace the added value of the court’s findings. Please note that only the added value shall appear in the summary. Stay as close as possible to the original wording of the judgment and obey any deviance of the wording if not absolutely necessary for the overall flow of the text. Deviations, addendums and omissions shall be indicated. The comment shall give the author enough freedom to comment on the outcome of the case. The author may put the case into its societal context, into context with other legislation or judiciary developments. Please note that a good comment is: 1. Easy to read, 2. Straight to the point and 3. as short as it requires to be. Regarding the citations & references, abreviations and style points, please refer to the ARTICLES section. The EDPL accepts submissions of book reviews. Authors can submit two types of reviews. (i) Standard Book Reviews – should be no longer than 1500 words in length, detail the contribution and structure of the book and give a critical appraisal of whether aims and objectives are met. (ii) Critical Book Review Essay – should be no longer than 3000 words in length and in addition to detailing the contribution and structure also assess critically the books arguments focusing on key philosophical or theoretical issues. Please note that submission of a manuscript does not guarantee publication. Responsibility of the factual accuracy of a paper rests entirely with the author. The manuscript must also be complete and final in terms of formulation and factual information so that no major corrections – only of typesetting errors or the like – will be necessary after type-setting, when an edited version will be returned to the author. Authors whose first language is not English should however ensure that their final draft is carefully spellchecked, preferably by a native speaker of English, for accuracy. Subsequent requests for corrections cannot be processed. The author will receive a free copy of the issue after printing.